The statue, by sculptor Jon Bickley, features Hodge sitting on a dictionary next to some empty oyster shells, in reference to Johnson's habit of buying the cat oysters to eat. This was not as extravagant as it sounds - oysters were cheap and eaten by the poor during the eighteenth century. What drew comment from contemporaries was that Johnson went out himself for the food. He feared that if servants were sent on an errand for the cat, they might come to resent and mistreat it. Where is Ye Olde Cheshire Cheese? This historic pub is only a stone’s throw from Dr Johnson’s House, on the corner of Wine Office Court and Fleet Street. In addition to serving a good pint of beer, the Cheese also boasts a Chop Room, the Johnson restaurant and a basement food bar. Why is there a plaque round the corner saying Johnson lived there? Johnson moved to London in 1737 and died there in 1784. During this time he lived in 17 known addresses, moving according to his financial means at the time. 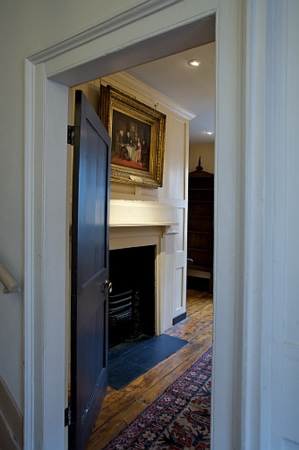 After leaving 17 Gough Square in 1759, Johnson lived in three of the Inns of Court and subsequently rented houses in Johnson's Court and Bolt Court, neither of which has survived. What is the little building next door? The small house next door is the Curator's cottage. It was purpose-built to house a custodian when 17 Gough Square was restored and opened to the public in the twentieth century. The house has been continuously occupied by a resident curator ever since and is reputedly the smallest residential house in the Square Mile. Where is the original Dictionary? The manuscript of the Dictionary has long been dispersed, although some fragments remain. Of the original run of 2,000 copies for the 1st edition, about half are accounted for today. Many are in private collections, but Dr Johnson’s House has two copies and the British Library has four. After Johnson left this house it was first used by other tenants, later became a hotel, a printer's workshop and finally rented out as warehouse space. This meant there were no furnishings left in situ. Johnson's possessions were dispersed after his death and very few remain. Some are on display in Dr Johnson's House and others can be seen in the Samuel Johnson Birthplace Museum in Lichfield. There are no detailed descriptions of Johnson's home and 17 Gough Square is today presented to tell the story of his life, works and friends, rather than to create a replica of his house.